Perhaps the single greatest impact on revenue improvement is accurate selection and placement of sales people; more than training, coaching or technology. Predictive analytics provide objective, scientific data to add clarity, improve accuracy and reduce risk in sales talent decisions. Pretium leverages the world’s leading sales talent analytics from GrowthPlay (formerly Chally Group) to unlock sales potential and accelerate revenue. Hiring the right people for the right roles for ultimate sales efficiency. Delivering compelling, actionable analytics to optimize your sales talent. Putting sales people in the right sales roles to better execute business strategies. 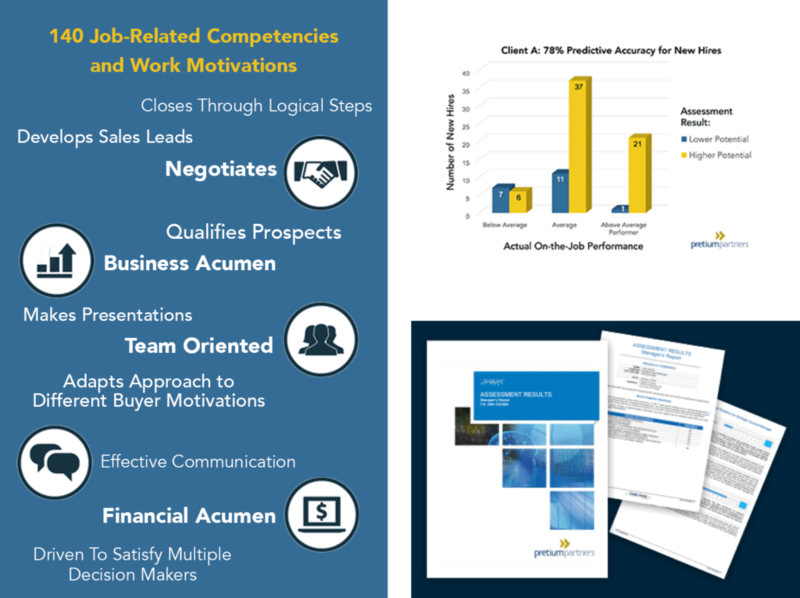 Identifying competencies unique to each sales role so as to make better decisions when hiring, training, coaching, promoting, or making internal selections. Designing and implementing training and development programs that maximize strengths and derive the highest possible return on investment. Executing go-to-market strategies; specifically, where sales role definitions change. 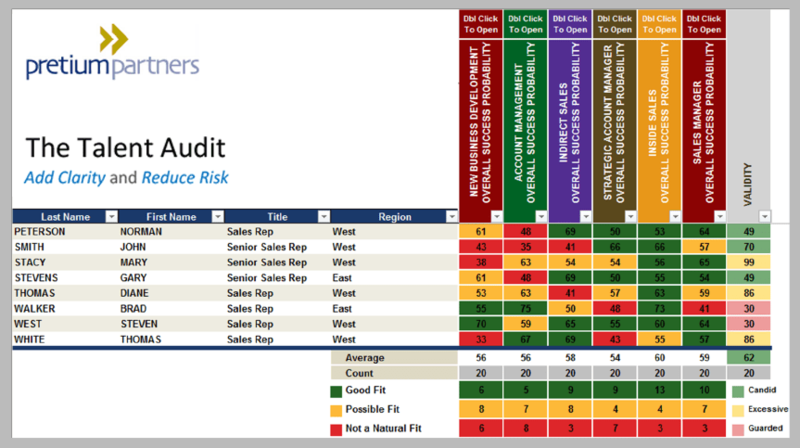 Improving hiring accuracy based on the unique requirements for each sales role. Identifying individual and group strengths and weaknesses in the sales team and making strategic decisions for role assignments, developmental plans and more. 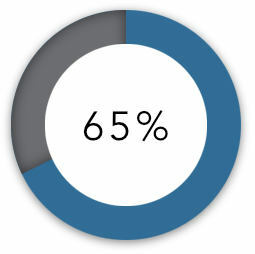 Most sales executives admit that their hiring success rate is well below 50%. This is an incredibility expensive problem. We have documented hiring accuracy as great as 83%. 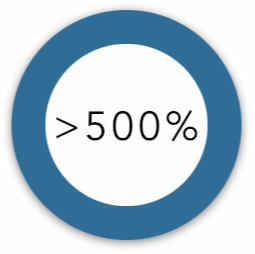 Every talent acquisition solution we have implemented achieved an ROI greater than 500% when it eliminates the 1st bad hiring decision. And that’s only the start. Role-specific profiles using competencies that statistically differentiate top performers from bottom performers. Making effective decisions about your sales organization is nearly impossible when relying on methods that are subjective, inconsistent, not tailored to specific job skills, or because the results are not meaningful enough to support objective and accurate decision making. The Talent Audit provides access to skill comparisons and overall success potentials with the same predictive accuracy seen the selection solutions. You are able to access a complete list of strengths and developmental needs for all key employees across every important position, team, or the whole organization. Coaching your core performers has the highest return. Talent analytics provide coaching with insight. Results also shown at the competency level providing insight for individual and group developmental focus areas. Contact us today and unlock your team’s potential!